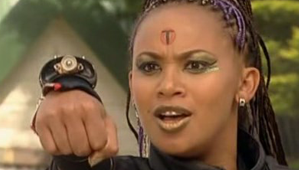 Java is an original member of the Technos, and first appears in series four episode one, and is one of Ram's 'girls'. Java exercises great influence within the Technos. She is loyal and protective of Ram, appreciating all he has done for her. Java is also respected on her own merits - she has excellent computer skills, but is mostly admired (and feared) as a ruthless warrior with great fighting skills. This has led Java to accompany Jay on many ground operations, and she developed quite an attraction for Jay. While she makes it clear to Jay she is attracted to him, despite her attempts, the attraction is mostly one-sided. In series five, she and Mega make plans to make Ebony believes Zoot has come back from the dead. 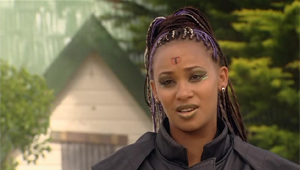 At first she and Mega are successful, but Ebony then realises she is being used with the help of Siva and Slade. Java is then held prisoner in a cage in the 'Zoot Park'. She is kept in the cage for several days because Mega hesitated to free her. But she is freed by him. After that, she and the rest of her Technos searched desperately for Ebony. Java is Ebony, and Siva's older sister, she is very protective and fond of Siva, but loathes Ebony for reasons that stem from their past. Java and Ebony's mutual hatred for each other reaches a climax when Java in an attempt to kill Ebony, accidentally shoots and kills Siva. Ebony retaliates by killing Java. Java only had the one outfit, she wore throughout her time on the series. The outfit was a black top, short sleeve, with a red and silver zipper at the front. This top also had a black and silver patch across the chest. She also wore a set of black wristbands on each of her arms. Java wore black pants with a top that matched a black belt. The belt was made out of a car seatbelt, with a silver and red buckle like the other Techno's. Java wore a set of headphones along with a wristband, which included a zapper on it. She later wore a black jacket with this outfit. Java's makeup also contained the same symbols as the other Techno's, which was a red circle on her forehead, with a T in the center.